According to the latest studies performed by the real estate industry, homeowners should expect to invest approximately 10% of their home's value into landscaping in order to maximize resale value. While this is rarely done, some investment should be expected and is essential to maintain the presentation of the residence as seen from the street; this presentation is commonly known by the trade term "curb appeal." Curb appeal generally refers to only the front of the residence, with the exceptions being the home rests upon a corner lot where one side can be seen from the street, or, in rare cases, where there is significant space between the neighboring homes where both sides as well as the front can be seen. When assessing the curb appeal of your home, it is best to take a look at the residence where it will be most vital-from the curb! Take note of what strikes you first; is your eye drawn to the cracks in the driveway? Are you wondering how that azalea ever became so overgrown? 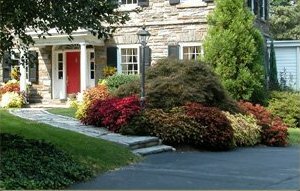 A well-planned front yard landscape should serve two purposes: complement the style, form & color of the residence, and lead the eye to the front door. Although we typically recommend consulting with a design professional, there are a few simple "rules" one can follow to improve the overall look of the front yard. First and foremost, unless your home is a replica of an Italian villa, try and stay away from the infamous geometric shrubs along the front of the residence. All of those cubes and spheres may appear interesting at first, and one may have spend several years training those lovely shrubs to perform as such, but to a prospective buyer they say one thing and they say it loudly-high maintenance. Much as with a pool, no matter how lovely and perfect they may be, a whopping percentage of prospective buyers will look right past their beauty and only see the work that goes along with them. There are many excellent trees and shrubs that grow here in North Georgia that naturally have a solid form to them, without evoking memories of long days in the sweltering heat trying with a set of power trimmers. Some of my particular favorites for this purpose are the Sasanqua Camellias (they are all lovely) and virtually any of the English Laurels, with 'Schipp' and 'Otto Luyken' being my favorite varieties. Another to consider if you have the space is the Little Gem Magnolia. This handsome fellow is a miniaturized (well, for a magnolia!) Southern Magnolia that blooms profusely over a long season and far earlier than its larger cousin. Bear in mind that this plant will eventually reach approximately twenty feet in height, but this is easily controlled by a few snips with a set of hand pruners throughout the year. Next, one will want to assess the sunlight the front (or sides if they are exposed) receives. Is the yard mostly sunny? Shady? A mixture? We are blessed here in North Georgia, especially in many of the inner-city neighborhoods, to have many large, fully-grown trees. These can be a blessing or a curse in regards to curb appeal, depending on the placement and type of tree. For instance, a sprawling, healthy White or Sawtooth Oak can be have a magnificent effect, but a Sweet Gum will only serve to remind a prospective buyer of how it felt the first time one of those infamous, spiky spherical seed pods felt across the shin when shooting out of the lawn mower. There are many lovely small trees, shrubs and perennials that grow in either full sun or shade in this region, so one shouldn't feel he has a limited pallet with which to work. For shady areas there are, of course, the many Evergreen Azaleas, Camellias and French Hyrdangeas, but there are a great many others, as well. Among my favorites are Sarcococca, Holly Fern, Oak-leaf Hydrangea (a Georgia native), Yellow Anise and Fatsia. For the more sunny lot, one might consider the English Laurels, Dwarf Gardenias (far less tempestuous than their larger cousins), Loropetalums (be mindful of the variety-some are quite large), and even the Sasanqua Camellias can take quite a bit of sun provide they receive a little relief from the worst heat of the day. Another rule of thumb to consider is the "cool/warm" factor in regards to colors. Typically, "warm" colors such as red, yellow and orange create a feeling of excitement and urgency. With the exception of the occasional "seasonal announcement" (Daffodils and Daylilies announcing the arrival of spring, or a small patch of Black-Eye Susans rejoicing in the blazing heat of summer), it is probably in one's best interest to keep keep warm colors in the front of the home to a minimum. There is a very fine line between a boisterous, exuberant front yard and a very loud and tacky one. Cooler colors such as blues, violets, pinks, whites and deep greens tend to bring about relaxation, and can be very inviting. This does not mean, however, that one should plant Purple Coneflower and Creeping Phlox with reckless abandon. Try to choose plants that will bloom throughout the course of the year; not only does this give one's landscape a more steady and balanced appearance, but this will also ensure that the landscape has advantaged appeal throughout the year. Remember, too, that there are a few trees and shrubs that can be structurally interesting without a stitch of leaves on them; Crepe Myrtles, River Birches and Harry Lauder's Walking Stick come to mind. Another "rule of thumb" to consider is what we call in the landscape design industry the "rule of odd numbers." Essentially, humans are naturally drawn to odd numbers (one, three, five, seven and so on), and typically only seek out even numbers under certain circumstances, i.e. framing of an entryway. Bearing that in mind, one should always plant in groups of odd numbers (sides of the doorway excepted)-one is better than two, three is better than four, five is better than six, so on and so forth. If you are going to plant just one of anything, be certain that it's something interesting. A Japanese Maple can certainly hold its own planted singly, for instance. The final design principle to which one must adhere is in regards to plant types. It is far more appealing to the eye to see large groupings of the same plant than several small groupings of many types of plants. Tiny "chunks" of plant groups not only create a rather disturbing level of "visual noise," but can also be a maintenance nightmare. Fewer types of plants in larger groups not only creates visual consistency, but also reduces maintenance (fewer types of plants=less types of maintenance required to memorize, and also allows for easier spotting of weeds). There are of course many other things that can be done to "touch up" the curb appeal of one's home (tasteful landscape lighting, a fresh coat of paint, etc. ), but for the most part one will want to keep things relatively simple and elegant. Adhere to these general guidelines, and one should see a drastic improvement in one's "curb appeal." Happy gardening!